The present invention provides a yarn with antimicrobial effects. The antimicrobial antifungal effect of the yarn is derived from nanosilver particles (diameter between 1 and 100 nm) which are adhered to the yarn. The yarn contains fibers which are made of cotton, linen, silk, wool, leather, blending fabric, synthetic fiber, or any combination thereof. The yarn can be used to make cloth to be used particularly for treating patients with burns or wound. The cloth made from the antimicrobial yarn can be further used to make clothes such as underwears, socks, shoe cushions, shoe linings, bed sheets, pillow cases, towels, women hygiene products, laboratory coats, and medical robes. The present invention also provides a method for making the antimicrobial yarn. Nano technology is the study and treatment of substance and material in a nanometer range. Nanometer equals to 10 −9 meter. The internationally acclaimed range for research and study for the nano technology is between 0.1 nm and 100 nm. The technology has been applied in the areas of information technology, energy, environment, and biotechnology. Particularly, the technology has been used in medicine including drug carrier, cell dye, cell separation, clinical diagnosis, and disinfection. For example, Japanese Patent No. 3-136649 discloses an antibacterial cloth used for washing breasts of milk cow. The Ag + ions in AgNO3 are crosslinked with polyacrylonitrile. The antibacterial cloth has demonstrated anti-bacterial activity on six (6) bacterial strains including Streptococcus and Staphylococcus. The silver of the nanosilver particles is made by reducing silver nitrate with a reducing agent which is not ammonia or ammonia water. The preferred reducing agent is glucose, vitamin C, or hydrazine hydrate (H 2NNH2.H2O). The yarn has antimicrobial effects against bacteria, fungi, and/or chlamydia, which include, but are not limited to,  Escherichia coli, Methicillin resistant Staphylococcus aureus, Chlamydia trachomatis, Providencia stuartii, Vibrio vulnificus, Pneumobacillus, Nitrate-negative bacillus, Staphylococcus aureus, Candida albicans, Bacillus cloacae, Bacillus allantoides, Morgan's bacillus (Salmonella morgani), Pseudomonas maltophila, Pseudomonas aeruginosa, Neisseria gonorrhoeae, Bacillus subtilis, Bacillus foecalis alkaligenes, Streptococcus hemolyticus B, Citrobacter, and Salmonella paratyphi C.
Alternatively, the step of soaking the yarn in the nanosilver particle-containing solution can be replaced with a step of spraying the nanosilver particle-containing solution to the yarn by a jet sprayer. FIG. 1 is a transmission electron micrograph (JEM-100CXII) which shows a yarn evenly attached with nanosilver particles. The diameters of the nanosilver particles were below 20 nm. The total wt % of silver in the yarn was 0.4-0.9%. A: Batch No. 010110; B: Batch No. 001226; C: Batch No. 001230; D: Batch No. 010322-1; E: Batch No. 011323; F: Batch No. 010322-2. The term “antimicrobial” as used in the context of “antimicrobial yarn,” “antimicrobial cloth,” and/or “antimicrobial clothes or clothing” in the present invention means that the yarn, cloth, or clothes (or clothing) has demonstrated antibacterial, antifungal, and anti-chlamydia effects by killing and/or suppressing growth of a broad spectrum of fungi, bacteria, and chlamydia, such as  Escherichia coli, Methicillin resistant Staphylococcus aureus, Chlamydia trachomatis, Providencia stuartii, Vibrio vulnificus, Pneumobacillus, Nitrate-negative bacillus, Staphylococcus aureus, Candida albicans, Bacillus cloacae, Bacillus allantoides, Morgan's bacillus (Salmonella morgani), Pseudomonas maltophila, Pseudomonas aeruginosa, Neisseria gonorrhoeae, Bacillus subtilis, Bacillus foecalis alkaligenes, Streptococcus hemolyticus B, Citrobacter, and Salmonella paratyphi C.
Microbial strains tested were  Escherichia coli, Methicillin resistant Staphylococcus aureus, Chlamydia trachomatis, Providencia stuartii, Vibrio vulnificus, Pneumobacillus, Nitrate-negative bacillus, Staphylococcus aureus, Candida albicans, Bacillus cloacae, Bacillus allantoides, Morgan's bacillus (Salmonella morgani), Pseudomonas maltophila, Pseudomonas aeruginosa, Neisseria gonorrhoeae, Bacillus subtilis, Bacillus foecalis alkaligenes, Streptococcus hemolyticus B, Citrobacter, and Salmonella paratyphi C. These strains were either isolated from clinical cases or purchased as standard strains from Chinese Biological Products Testing and Standardizing Institute. (v) After 100 times of washing procedure according to (i) to (iv), nine batches of antimicrobial yarn were tested for antimicrobial activity on  Staphylococcus aureus, Escherichia coli, Candida albicans, and Pseudomonas aeruginosa according to the method provided in Example 4. 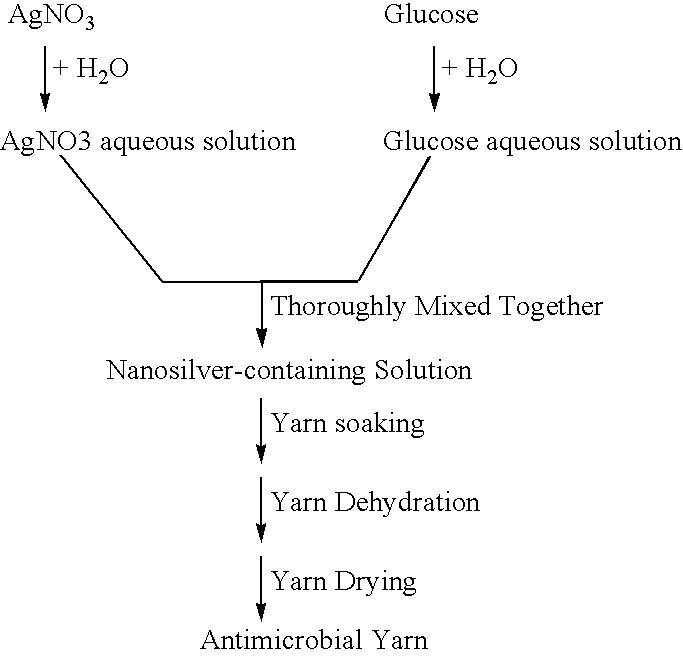 (ii) The yarns of (i) were tested for antimicrobial activity on  Staphylococcus aureus, Escherichia coli, Candida albicans, and Pseudomonas aeruginosa, according to the method provided in Example 4.
nanosilver particles which are attached to fibers of said yarn; wherein said nanosilver particles are 1-100 nm in diameter; and wherein said nanosilver particles-containing fibers contain about 0.2 to 1.5% by weight of silver based on the total weight of said yarn. 2. The yarn according to claim 1, wherein said silver of said nanosilver particles is made by reducing silver nitrate without the use of ammonia water as reducing agent. 3. The yarn according to claim 1, wherein said silver of said nanosilver particles is reduced by a reducing agent which is glucose, vitamin C, or hydrazine hydrate. 4. The yarn according to claim 1, wherein said fibers of said yarn are made of at least one selected from the group consisting of cotton, linen, silk, wool, blending fabric, and synthetic fiber. 5. The yarn according to claim 1, wherein said yarn is in natural color or dyed with different color. 6. The yarn according to claim 1, wherein said yarn inhibits growth of bacteria, fungi, or chlamydia. 7. The yarn according to claim 6, wherein said bacteria, fungi or chlamydia are at least one selected from the group consisting of Escherichia coli, Methicillin resistant Staphylococcus aureus, Chlamydia trachomatis, Providencia stuartii, Vibrio vulnificus, Pneumobacillus, Nitrate-negative bacillus, Staphylococcus aureus, Candida albicans, Bacillus cloacae, Bacillus allantoides, Morgan's bacillus (Salmonella morgani), Pseudomonas maltophila, Pseudomonas aeruginosa, Neisseria gonorrhoeae, Bacillus subtilis, Bacillus foecalis alkaligenes, Streptococcus hemolyticus B, Citrobacter, and Salmonella paratyphi C.
8. An antibacterial or antifungal cloth, wherein said antibacterial or antifungal cloth comprises said yarn according to claim 1. 9. The antibacterial or antifungal cloth according to claim 9, wherein said antibacterial cloth is used to treat patient with burn and scald-related skin infection, wound-related skin infection, dermal or mucosal bacterial or fungal infection, surgery cut infection, vaginitis, and acne-related infection. 10. The antibacterial cloth according to claim 8, wherein said cloth makes antibacterial clothes. 11. The antibacterial cloth according to claim 9, wherein said antibacterial clothes are at least one selected from the group consisting of underwears, socks, shoe cushions, shoe linings, bed sheets, pillow shams, towels, women hygiene products, laboratory coat, and medical robes. dehydrating and drying said nanosilver particle-attached yarn to form said yarn with antimicrobial activity. 13. The method according to claim 12, wherein said yarn is pre-degreased before soaking in said nanosilver particle-containing solution. 14. The method according to claim 12, wherein said aqueous silver nitrate solution and said aqueous solution of reducing agent are mixed at 0-40° C.
15. The method according to claim 12, wherein said mixture of said aqueous silver nitrate solution and said aqueous solution of reducing agent is colorless and transparent. 16. The method according to claim 12, wherein said soaking of said yarn in said nanosilver particle-containing solution is replaced with spraying said nanosilver particle-containing solution to said yarn by a jet sprayer. 17. The method according to claim 12, further comprising a step of treating said nanosilver particle-attached yarn with heat at 120-160° C. for about 40-60 minutes. 18. The method according to claim 12, wherein said reducing agent is glucose, vitamin C, or hydrazine hydrate. 19. The method according to claim 12, wherein said nanosilver particle is sized between 1 to 100 nm. 20. The method according to claim 12, wherein each liter of said nanosilver particle-containing solution comprises 2-40 g of silver nitrate and 0.5-62 g of reducing agent. 21. 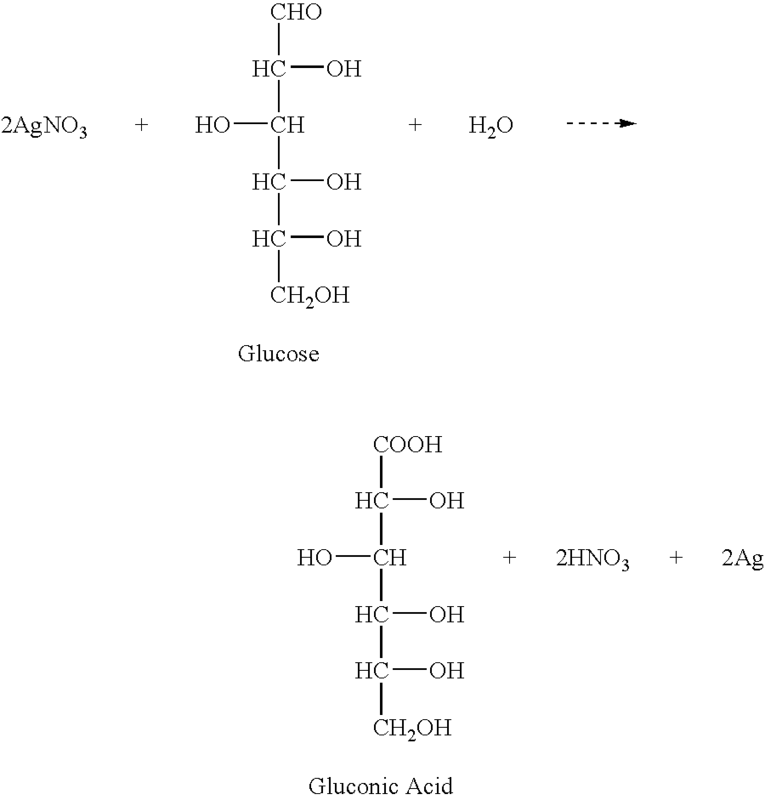 The method according to claim 20, wherein said reducing agent is glucose. 22. The method according to claim 21, wherein said silver nitrate and said glucose is at a ratio of about 0.03-80:1 by weight. 23. The method according to claim 11, wherein said yarn contains about 0.2% to 1.5% by weight of silver in a form of attached nanosilver particles. DK200600257U4 (en) * 2007-02-09 2008-06-13 Suprema Down As Natural filling for duvets / pillows.